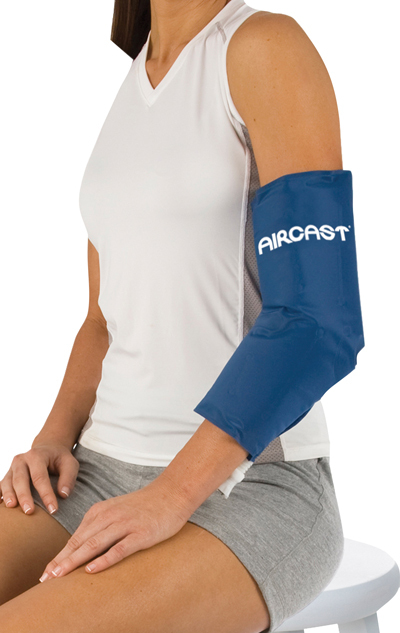 Cold therapy with the AirCast® CryoCuff® combines compression and cold. 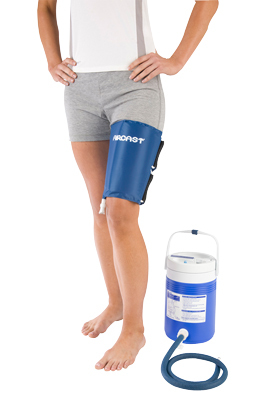 Compression minimizes swelling, while cold minimizes pain. Set consists of water cooler and cuff. Cooler holds enough ice and water for 8 hours of cryotherapy. Compression is gravity controlled. Cuffs are made of nylon and vinyl. 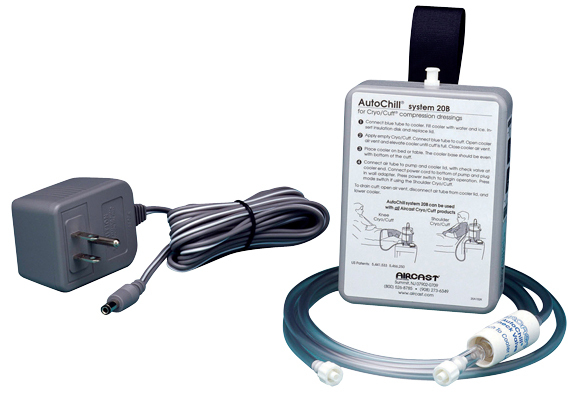 Use with gravity feed (included) or continuous AutoChill electric pump (sold separately). 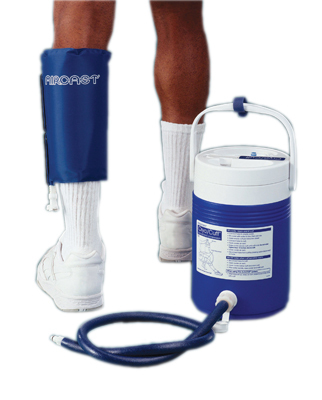 Gravity feed cooler for AirCast® CryoCuff® system. Cooler holds enough ice and water for 8 hours of cryotherapy. Compression is gravity controlled. Cuffs are made of nylon and vinyl. 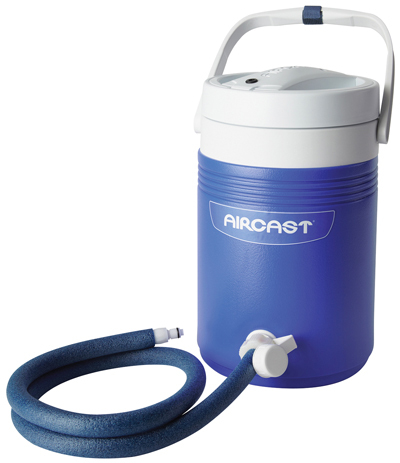 AutoChill® continuous electric pump cooler for AirCast® CryoCuff® system. Dimensions: 7" x 2.75" x 5.5"
Integrated cold and compression is clinically proven to help reduce post-operative swelling and regain range of motion. 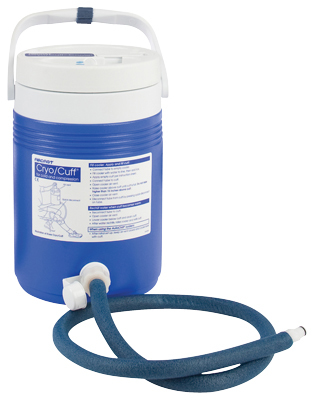 The Cryo/Cuff IC provides both gravity and motorized cold and compression therapy for flexibility of care. 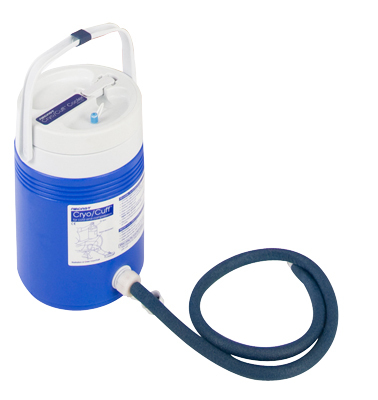 An integrated pneumatic pump within the cooler lid provides automated cold and compression therapy, with simplicity of design and ease-of- use operation. 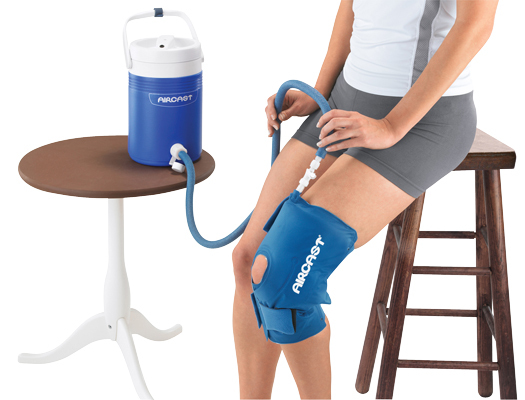 Indication: Ideal for post-operative recovery, trauma, athletic training rooms, and home use. 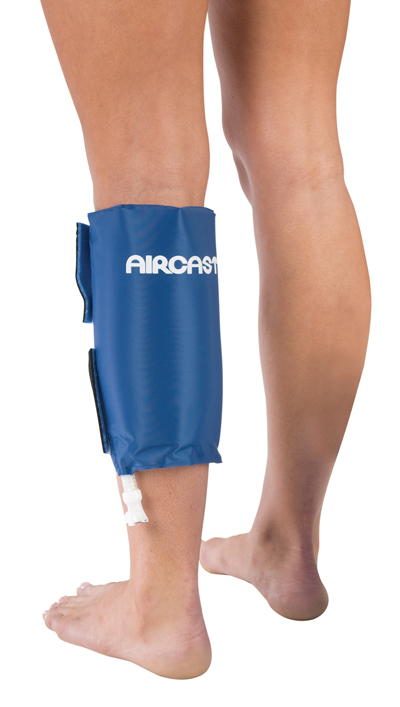 Ankle Cryo/Cuff® anatomically designed to completely fit the ankle. Minimizes hemarthrosis, swelling and pain. Universal adult size. Also available in pediatric size. 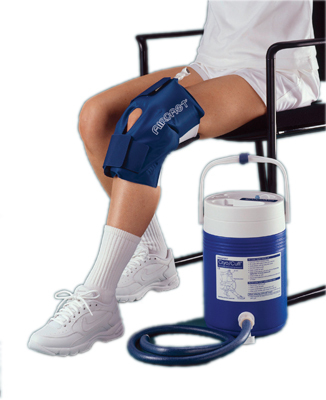 Indication: Ideal use for acute sprains, trauma, post-op, and rehabilitation. 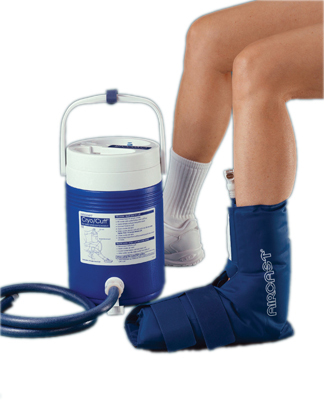 Dimensions: 13" x 1" x 12.5"
Foot Cryo/Cuff® anatomically designed to provide complete foot coverage for optimal management of swelling and pain. Indication: Ideal use for turf toe and post-op. Knee Cryo/Cuff® anatomically designed to completely fit the knee. Minimizes hemarthrosis, swelling, and pain. Available in three adult sizes. Also available in pediatric size. 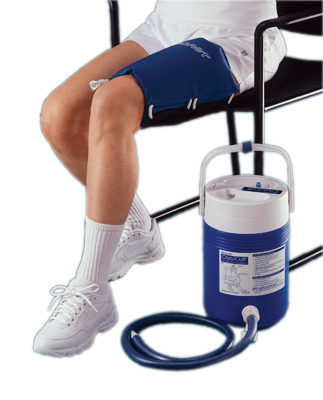 Indication: Ideal use for trauma, post-op, rehabilitation, and sports injuries. 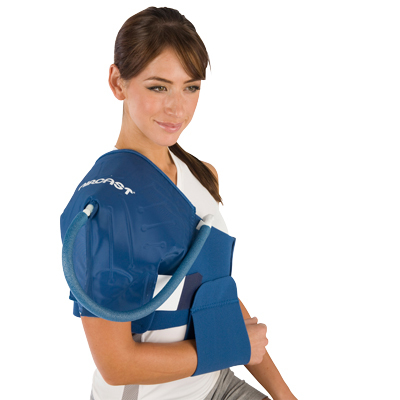 Dimensions: 15" x 1" x 13"
Shoulder Cryo/Cuff® anatomically designed to cover the shoulder area completely. Minimizes hemarthrosis, swelling, and pain. 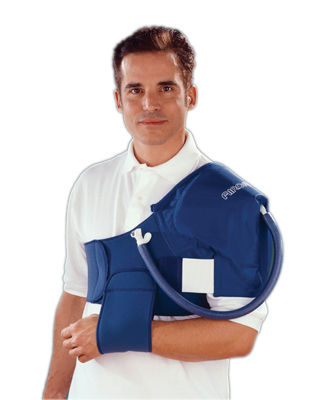 Can be ordered with an XL strap to accommodate larger torso/chest circumferences. Indication: Ideal use for trauma, post-op, rehabilitation, and sports injuries. Thigh Cryo/Cuff® is designed to completely fit the thigh. Minimizes swelling and pain. Indication: Ideal use for stress fractures, sports injuries, and soft tissue injury. Back/Hip/Rib Cryo/Cuff® universal fit. The versatile design may be applied either to the back, hip, or rib area. Minimizes swelling and pain. Indication: Ideal use for chronic/acute pain; post-op and sports injuries. 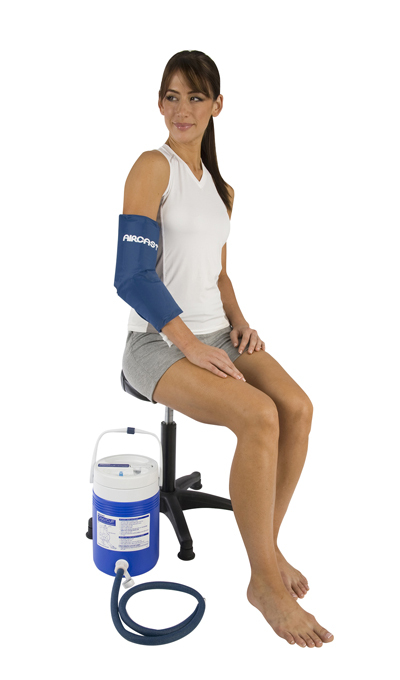 Elbow Cryo/Cuff® anatomically designed to fit the elbow. Minimizes hemarthrosis, swelling, and pain. One size for adults. Also available in a pediatric size. Indication: Ideal use for epicondylitis (tennis elbow), post-op, and throwing injuries. 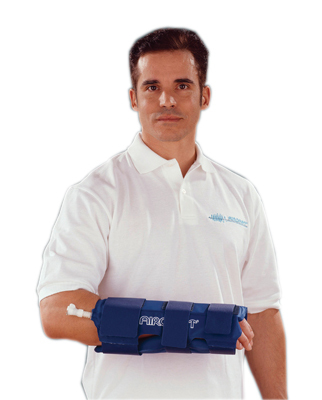 Hand/Wrist Cryo/Cuff® anatomically designed to cover the hand and wrist. Versatile design allows repositioning for desired hand coverage. Minimizes swelling and pain. For added support, aluminum support bars are incorporated and can be removed if increased range of motion is desired. 12" long. Indication: Ideal use for carpal tunnel syndrome, tendonitis, post-op, and sports injuries.